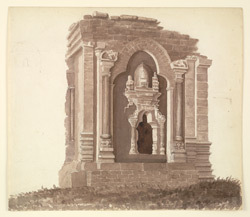 Sepia wash drawing by Sir James Abbott (1807-1896) of a ruined temple near Pind Dadan Khan in the Punjab in Pakistan. The artist wrote, 'This singular Scytho Greek Ruin is at the old deserted Fort of Raam Kata or Mulote or Shahgurh. It bears all three names in the Salt Range Dooka Indus and Hydaspes. It must be 1500 years old. I had not time to make a very perfect sketch. The sculpture is much corroded by time. The figures are many of warriors in plate mail. It is about 25 miles N. West of Pind Dadun Khan. Sketched April 1849. J. Abbott'.